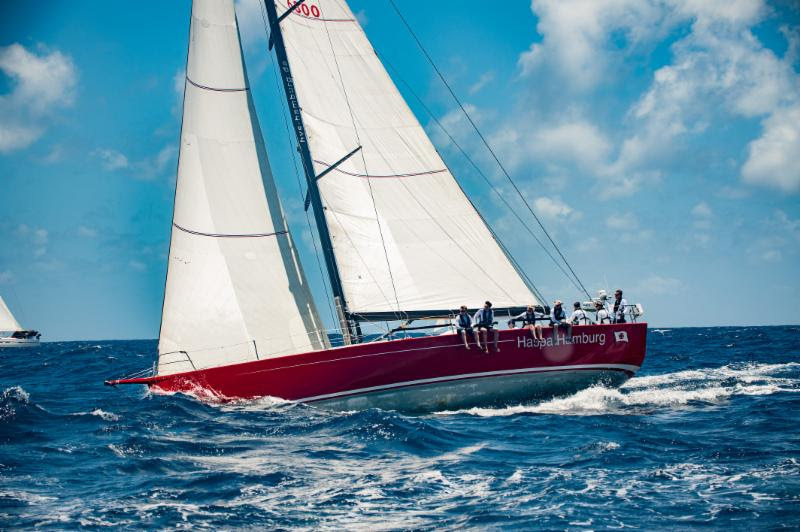 After the first night at sea for the international fleet in the Antigua Bermuda Race the pace is relentless. The leading teams Warrior and Varuna are now over 300 miles offshore, blast reaching through two metre swell in the Atlantic Ocean. Warrior was observed to be hitting a top speed of 25 knots last night. 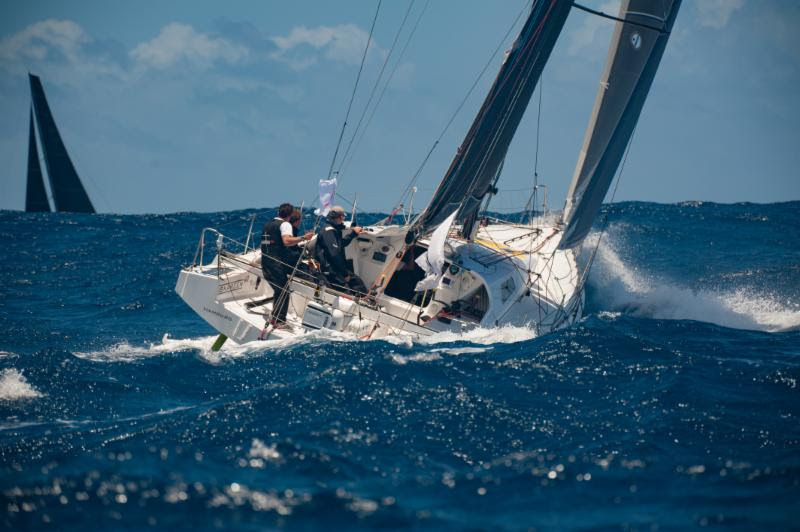 At 1200 UTC on Day Two, the turbo-charged Volvo 70 Warrior, sailed by Stephen Murray Jr. had averaged 18 knots since the start of the race and will achieve a 24 hour run of about 450 miles; well inside record pace. Jens Kellinghusen’s German Ker 56 Varuna is also set for a 400 mile run in 24 hours. Varuna is 30 miles behind Warrior but is estimated to be leading the fleet after IRC time correction. 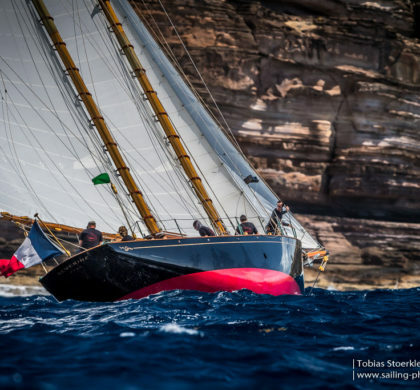 The most easterly of the chasing pack is Giles Redpath’s British Lombard 46 Pata Negra, skippered by Oliver Heer. Pata Negra’s crew include Gareth Glover, two-time skipper in the Clipper Round the World Race and the rest of the crew are all Oliver’s friends from Switzerland, and will be celebrating his 30th birthday today: “I love to sail, but it does take me away from my friends and family, so when I knew I would be at sea for my 30th, what better way to celebrate than with friends racing to Bermuda!” commented Oliver before the race. The most westerly team is Arnt Bruhn’s German Class40 Iskareen. Arnt has competed in over five transatlantic races, winning his division on numerous occasions. 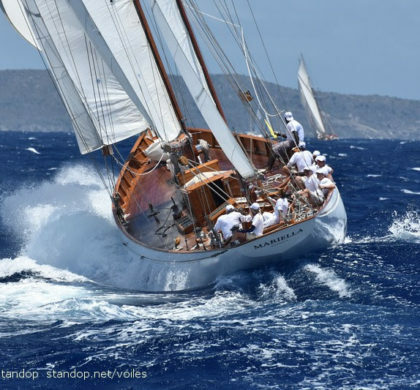 After the Antigua Bermuda Race, Iskareen will compete in the Atlantic Anniversary Regatta, racing 3,900 miles from Bermuda to Hamburg, organised by the Norddeutscher Regatta Verein (NRV) of which Arnt Bruhns is a member. 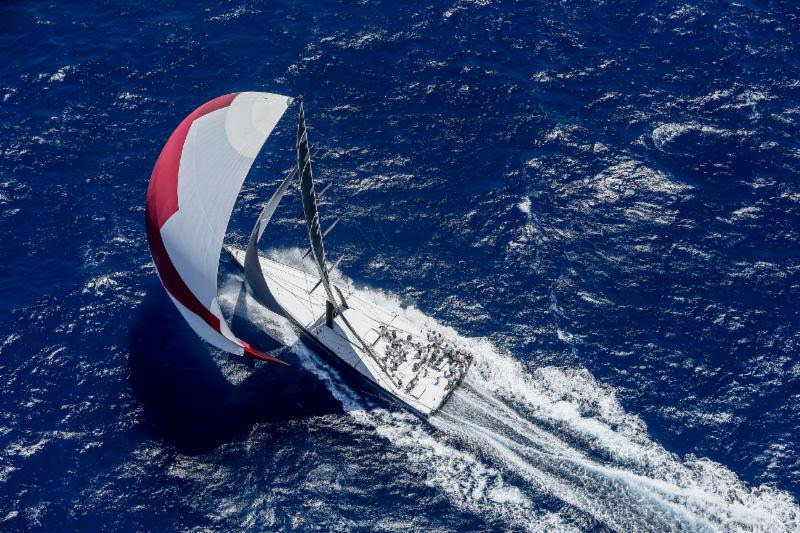 Arnt will then take part in the solo Route du Rhum Race this November. 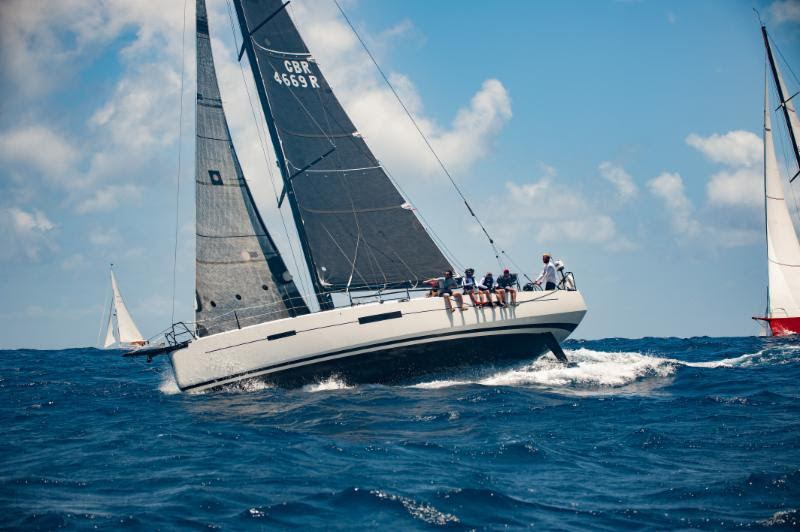 Of the six German teams racing to Bermuda, Iskareen is second on the water behind Varuna. Sebastian Ropohl’s JV52 Haspa Hamburg and Joachim Brünner’s Andrews 56 Broader View Hamburg are locked into a match race, as are two German Swans; Hanns Ostmeier’s Swan 45 High Yield and Michael Orgzey’s Swan 48 Dantes. The vast majority of the fleet are to the west of the rhumb line, putting in additional miles to avoid an area of high pressure that is expected to arrive from the northeast tomorrow (Friday 11th May). At the moment, the strategic decision is to decide how far west to go to achieve the best performance. Eric de Turckheim’s French Nivelt-Muratet 54 Teasing Machine, skippered by Laurent Pages has positioned closer to the rhumb line than the leaders; they will be hoping to stay in good breeze and sail less miles than the leading boats.